As we cruise our way through the summer, firework festivals are just over the horizon ♩ Large-scale firework festivals will spring up all over the country, so it can be difficult to decide which one to attend – but don’t worry – this article will lend a helping hand, as we’ll be introducing the most popular and most unique large-scale firework festivals in the Kanto region! This is one of the earlier firework festivals that takes place in Tokyo. In just one hour, approximately 13,600 fireworks lift off into the sky. The true charm of the show is that a high density of fireworks explodes in a condensed and organised manner. This is the first ever fireworks display to have used Niagara-style fireworks and Star Mines that explode to fit a dramatic piece of music. This display is special because it incorporates a variety of colours that you won’t get bored of! This festival has been running for more than half a century and is much-loved by the locals! From the river, you can see the fully-loaded impact of the fireworks launch into the sky at point-blank range. The “Mount Fuji Niagara” allows spectators to enjoy fireworks from their launch at ground level to when they explode in the sky. During this programme, classic and Japanese instruments are fused for the “Digital Star Mine” performance. Niagara fireworks falling from the heavens is the masterpiece of this event. 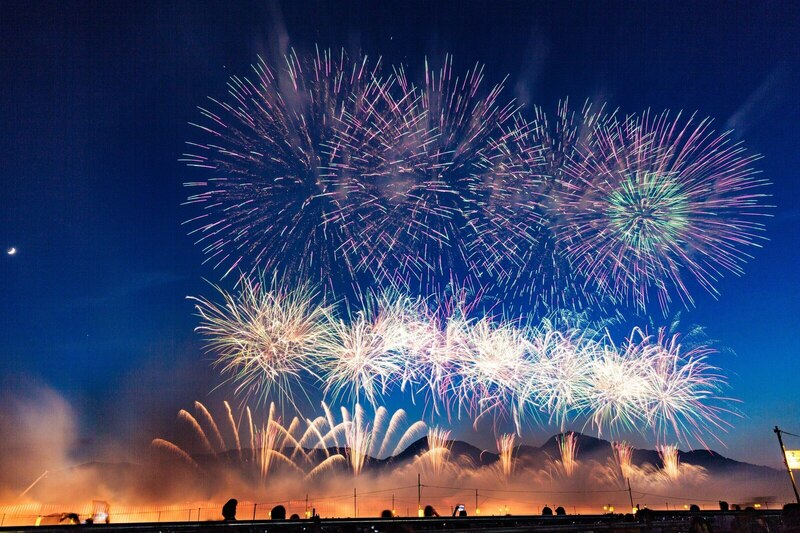 This firework festival unfolds on the coast of Kanagawa. This festival is famous for its fireworks that blossom in the water! Fireworks are thrown into the sea from a moving boat and explode with passion above the sea. As Kanagawa is also a famous touristic location, you should definitely go sightseeing during the daytime. This will be the 40th anniversary of the Makuhari Beach Fireworks festival, displaying approximately 20,000 fireworks as the largest fireworks festival in the country. You can only experience such an intense display over the sea at Makuhari. The theme for this event is “Makuhari seaside fireworks spreading across the globe”. From the opening to the finale, this hour-long event will open with approximately 3,300 musical Star Mines. To commemorate 40 years of running, this year, “THE MAKUHARI HANABI” programme will also feature a large round fireworks display of approximately 4,400 fireworks as the main attraction. For the grand finale, around 7,500 fireworks will glisten under the full moon, turning the entire night sky silver with Niagara fireworks. This is said to have originated in the year 1733 with the purpose of praying for those who died from famine the previous year. Due to its formality and tradition, this is the greatest fireworks festival in the whole Kanto region. After being suspended several times throughout history, in 1978 it was brought back to life as the Sumida River Firework Festival. The one venue spans from downstream the Sakurabashi bridge to the Kototoibashi bridge. This is where pyrotechnicians with excellent reputations gather and have a showdown! Spectators view their passion, as their pride booms in the sky. You mustn’t miss out on the new fireworks that each company has to offer! This is the place to enjoy historic tradition! This is a large-scale fireworks display that takes place at Edo River (Tokyo) and Ichikawa (Chiba) at the same time. There are eight different themes of fireworks, each with a different image to compliment the background music. As is tradition, 1,000 fireworks are launched in the first five seconds to open the show, and after 75 minutes, the exploding fireworks form streams of gold and silver to create the image of a gold crown for the finale. The images that are constantly changing in the sky with every explosion is certainly the most fascinating feature of this event! So how about it? This summer, gather your family, lovers and friends and create a night to remember at a fireworks festival you have never been to! Japanese firework festivals are overflowing with creativity, so please enjoy them!